It might seem paradoxical that a character so stereotypically Australian as Alan Jones remains the driver by which a team so stereotypically British as Williams has come to measure all others. But in their shared no-nonsense, tough love approach, they couldn't have been more compatible. The fact that Jones was the driver who turned Williams from middling privateers into world champions didn't hurt, either. Four wins in 1979 with the FW07 gave the team a kick-start, and set the scene for the five victories in 1980 that put Jones 13 points clear of Nelson Piquet to give him the title. A fierce intra-team rivalry with Carlos Reutemann helped deny him back-to-back championships and he retired at the end of the year, notwithstanding a couple of fruitless comebacks with Arrows and Team Haas. 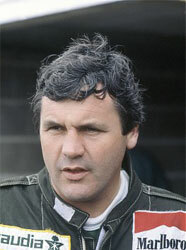 Should Alan Jones be higher or lower in F1's greatest drivers?